I just love the shine on the Year of Cheer Specialty Designer Series Paper! Combining gold, silver and copper isn’t something I would normally do, but it totally works with this paper. 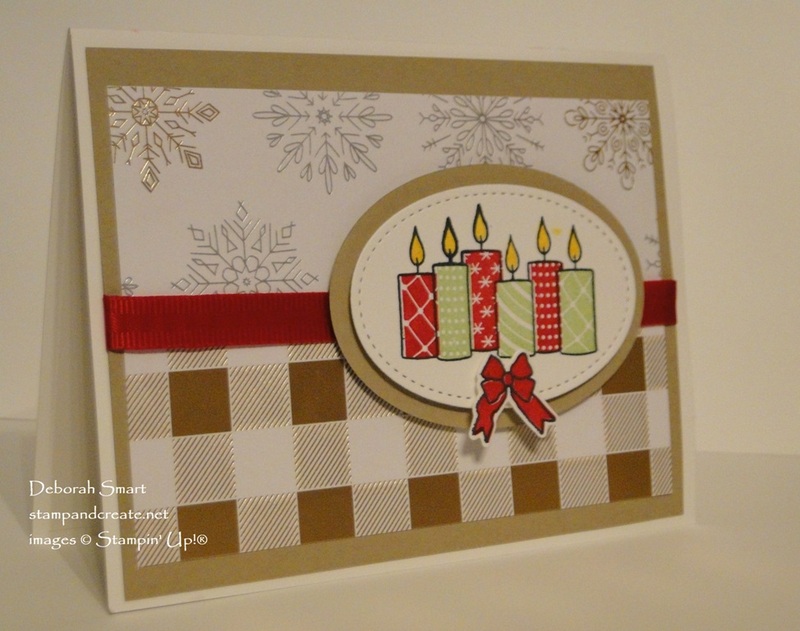 This card is one that we did in last weekend’s Christmas stamp-a-stack. It features this beautiful paper. I combined two patterns from the Year of Cheer Specialty DSP, and added some classic red and green. Start with a Whisper White cardstock base, and set it aside. Cut a panel of Crumb Cake cardstock to 4″ x 5 1/4″, and add the 2 patterns of DSP, each cut to 3 3/4″ x 2 1/4″. Use Multipurpose Liquid Glue, as you’ll be adding dimension with the other elements. Once your DSP panels are attached, wrap a length Real Red 1/8″ Solid Ribbon across the middle, to cover the join of the the 2 patterns. Attach the ribbon at the back, with Tear & Tape. 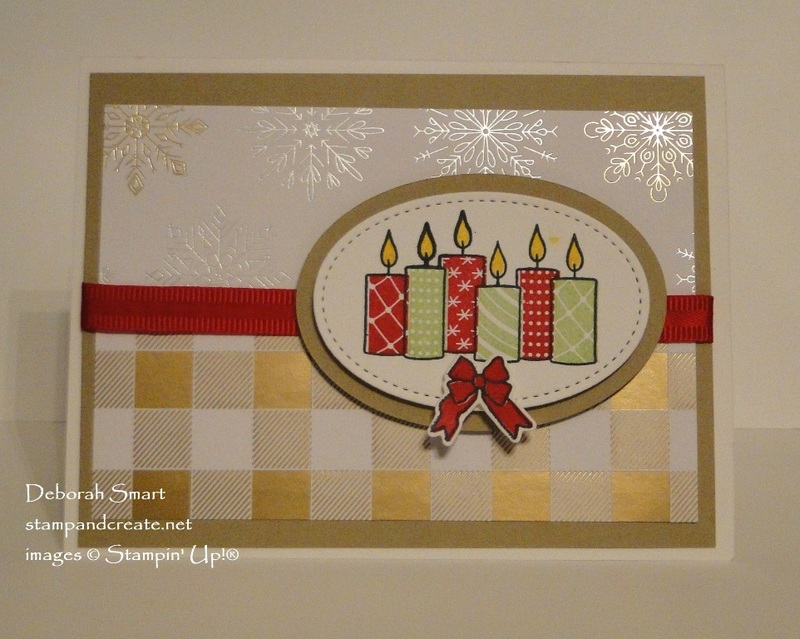 Use the Merry Patterns stamp set to stamp the candles onto another piece of Whisper White. I used Memento black for the outline, and Real Red and Pear Pizzazz for the candles. Use Crushed Curry ink for the candle flames. After stamping, use the Stitched Shapes Thinlits and Big Shot to die cut the image. Use the Layering Ovals Thinlits to die cut a larger oval in Crumb Cake cardstock. Layer the stamped image over the Crumb Cake oval with Stampin’ Dimensionals. The bow is from the Brightly Lit Christmas stamp set; stamped in Real Red and Memento black ink. It’s die cut with the Big Shot and Christmas Lamp Post Thinlits. (you can Bundle the Brightly Lit Christmas & Christmas Lamppost Thinlits, and SAVE 10%!). Add the bow with another Dimensional, under the candles. 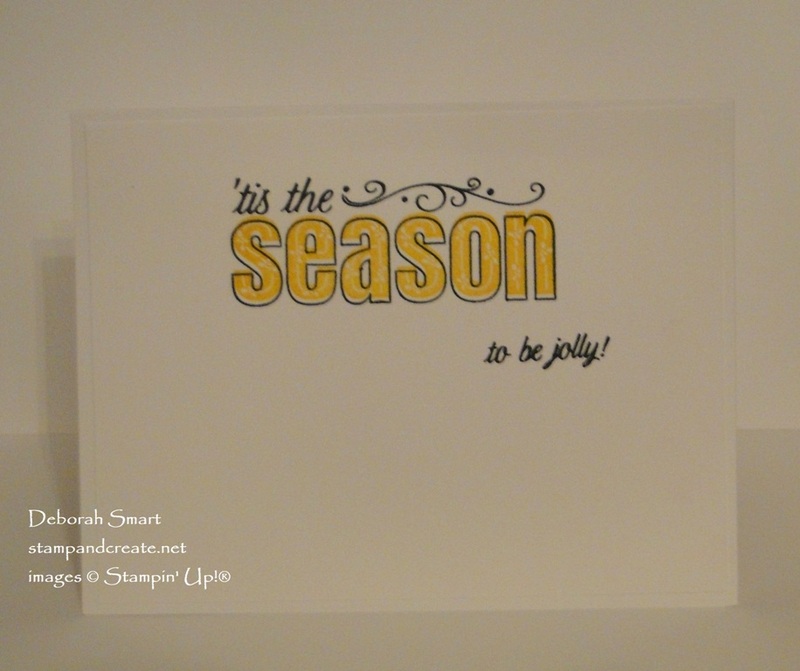 I combined 2 of the sentiments for the inside – because they go together perfectly! The outline is Memento black ink, and the inside pattern is Crushed Curry ink. I think that the patterns in the Merry Patterns set work well with the patterns in the Year of Cheer paper, don’t you? It’s just too bad that this fun stamp set is no longer available. With the exception of the Merry Patterns stamp set, all the other products I used on this card are available for you to order! Plus, during this week of Online Extravaganza, I’m giving FREE SHIPPING on orders of $50 or more! You must use Host Code FXDASWQU for your online orders, and be within Canada. Once your order has shipped, I’ll refund the total shipping cost by e-transfer. The products don’t have to be only from the Extravaganza sale list; they can be from the Annual and Holiday catalogues, and the Clearance Rack, as well! To go to my online store, simply click on the product images below, or click on my signature. My store is open 24/7, so you can shop when it’s convenient for you!